When Benjamin Netanyahu went to France, in the wake of the killing of four Jews in a kosher supermarket in Paris, to persuade French Jews that their 'real home' was not France but Israel, he got short shrift - both from French Jews and France's leaders. [Leaders reject Netanyahu calls for Jewish mass migration to Israel] This is the Zionist answer to anti-Semitism. Run away from it, repatriate yourself. That is what the Campaign Against Anti-Semitism's real game is. 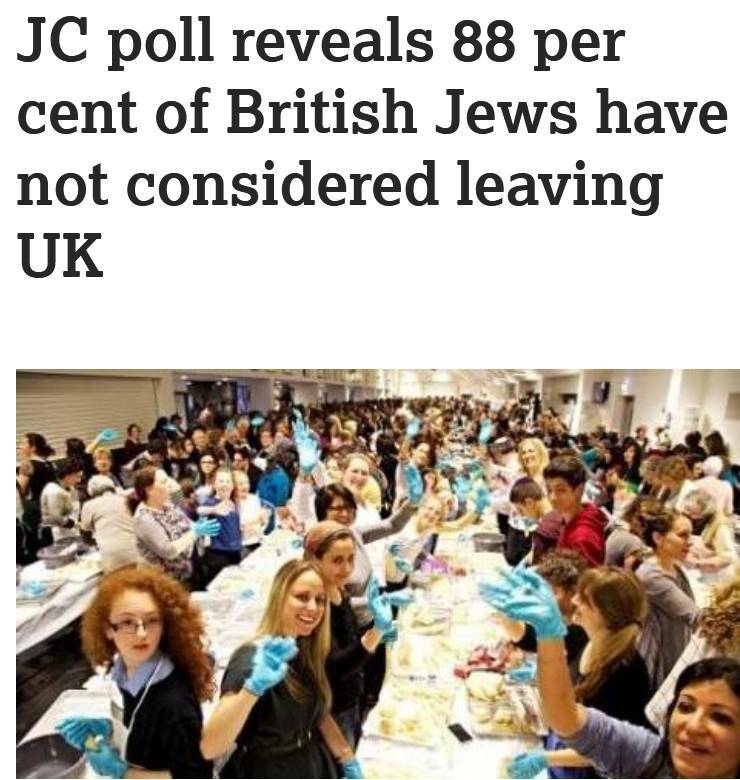 It wants British Jews to go to Israel. That is why its focus is not on the far-Right but the anti-Zionist left and Muslims. Can you imagine what the Campaign Against Anti-Semitism would have done if it had been members of PSC or prominent anti-Zionists who had been caught holding a picket of a Zionist meeting with members of the neo-Nazi Britain First? The group that Thomas Mair, Jo Cox MP’s murderer was associated with. It would have been all over social media and their web site. We would never have heard the end of it. There would have been articles in the Guardian and the Daily Mail all proclaiming the alliance between the far-left, Palestine haters and fascists. Instead of course silence. 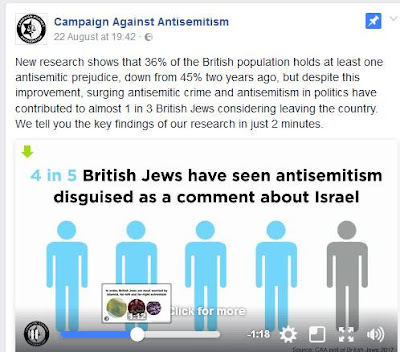 The Community Security Trust is a thoroughly Zionist organisation and as I have shown is happy to hype and inflate the amount of genuine anti-Semitism in Britain. Their Anti-Semitism Incidents Report for January-June 2017 shows a ludicrous increase of 30% in anti-Semitic hate crime in the last year. Nonetheless the CST, because it does at least take its job of collating anti-Semitic incidents seriously, leaving aside the question of how it defines those incidents, accepts that most anti-Semitism comes from the Far-Right. 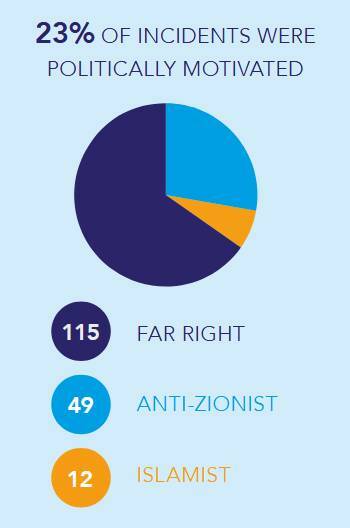 In its latest Report it has a graph showing that out of 176 anti-Semitic incidents, 115 of them were perpetrated by the far-Right, 49 by anti-Zionists and 12 by Islamists. 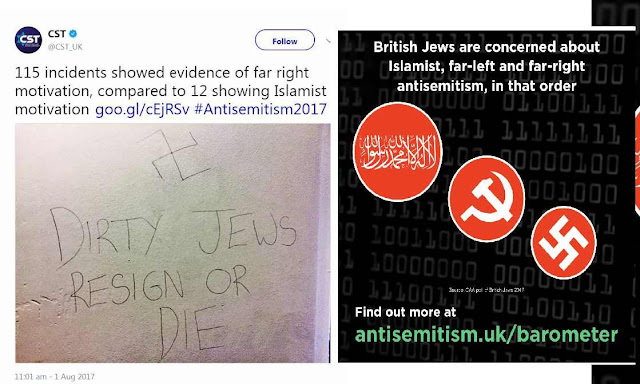 I don’t accept that anti-Semitic incidents are perpetrated by anti-Zionists for the simple reason that anti-Zionism and anti-Semitism are diametrically opposed to each other. If someone is anti-Semitic then they are not anti-Zionist. 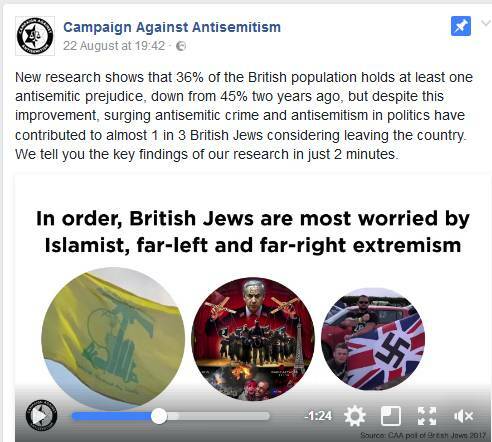 There may be people who are both pro-Palestinian and anti-Semitic, but today it is the far-Right which combines both anti-Semitism and pro-Zionism. 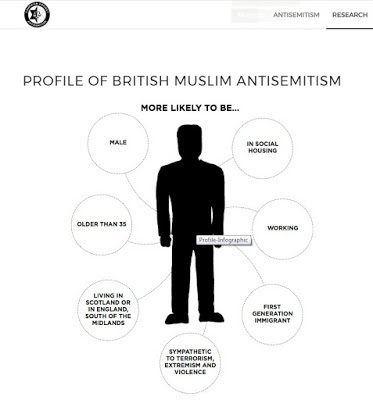 The CST which unlike the CAA, is not overtly anti-Islamic, has no problem tweeting out that most anti-Semitism comes from the far-Right not Muslims. The Campaign Against Anti-Semitism does the exact opposite. 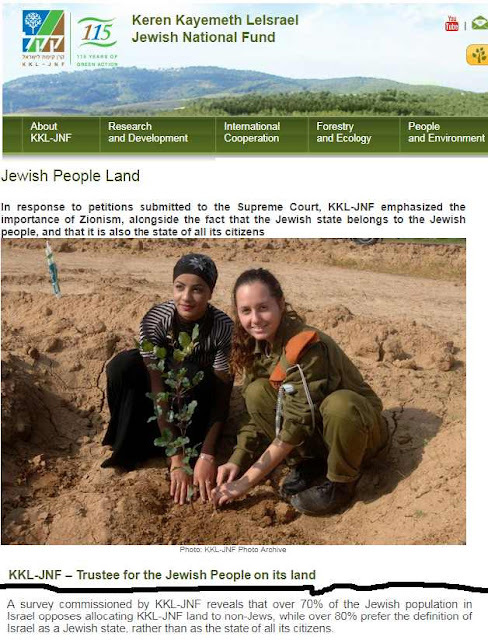 It is a purely political Zionist organisation. 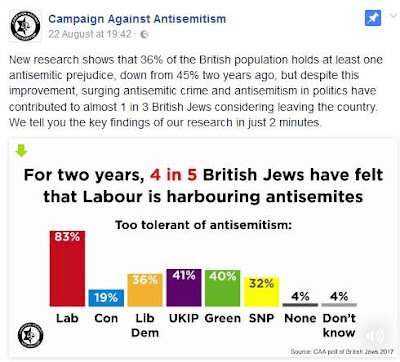 It has no interest in anything other than using contrived and manipulated opinion polls to hype up fears of ‘anti-Semitism’ amongst the Jewish community with the purpose of encouraging Jews to go to Israel. The CAA ludicrously claims on its Facebook page that 36% of British people are anti-Semitic and that one-third of British Jews are considering leaving the country. 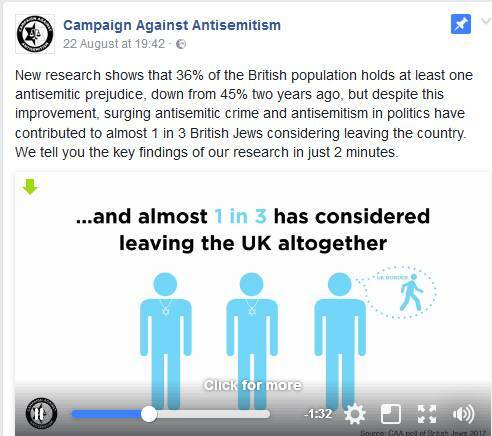 These lies have been debunked before, not least by the Jewish Chronicle in a poll by Survation, in direct response to a previous campaign by CAA. This is slightly different from the hysterical 1/3 figure that the CAA likes to quote. 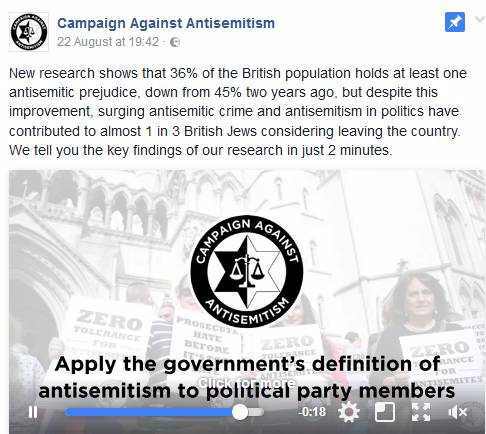 In other words it is a 100% racist organisation and it is no surprise that Falter and co. should be trying to stir up fears of anti-Semitism. 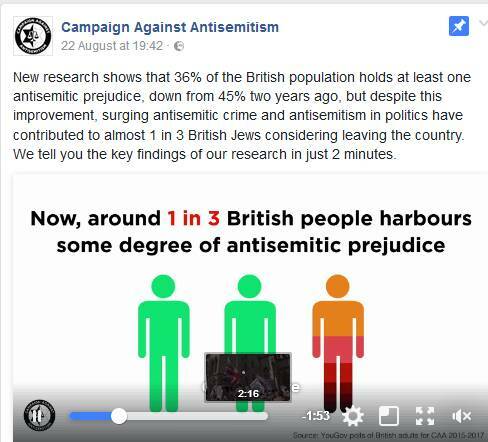 If British Jews do think that it is the left and Muslims are anti-Semitic then it is groups like CAA who are to blame for lying to them, with the support it has to be said of much of the British media, the BBC included.